NEW ORLEANS — The four-year wait is over! Starting today, the 2016 Rio Olympics get underway in Brazil, but track & field fans must wait until next Friday, August 12, for the start of the athletics portion of the program. 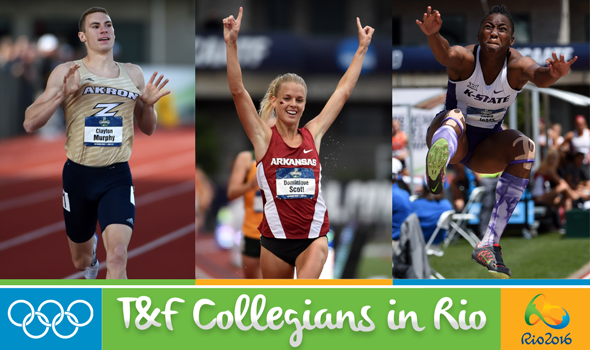 Fret not, fans, because when the best athletes in the world take to the track and the field in a week’s time, a number of collegians from the 2015-16 academic year will join them in the medal hunt. In fact, 90 collegians from 55 programs — ranging from NCAA Division I champions Arkansas and Florida to NJCAA Central Arizona — will represent 28 countries in Rio. Twenty-nine of those collegians won individual championships during the 2015-16 academic year, with seven earning indoor and outdoor titles (Devon Allen, Jarrion Lawson, Clayton Murphy, Courtney Okolo, Keturah Orji, Lexi Weeks and Kendell Williams). The country with the most collegians in Rio is the United States of America with 24, followed by nine from Canada and Jamaica. Twelve different countries have a single collegian competing on their roster. When it comes to the programs with the most collegians in Rio, it’s a tie between Georgia and Texas A&M with six each. Arkansas and Texas both have five, while Florida State has four.